It always makes me happy when a season begins to turn. For me it is a tangible reflection of the philosophy: "This too shall pass." Seasons change. So do circumstances. Summer to Autumn is probably my favorite of these changes. The frantic heat of the day calms itself, relaxing into a peaceful coolness.The humidity dies down and the breeze picks up a freshness. The night air, with its briskness, feels like something is on its way. And the colors of fall mix the warmth of summer with the earthy bareness of approaching winter. Autumn has only tentatively peaked its head into Rome in the last week, ducking back out this weekend when temperatures rocketed into the 90s F (mid-30C), but I know that with each September day creeping by, an autumn filled with promise isn't far away. In Italia, equivalent autumn-esque events are the Sagre, local festivals usually coinciding with a harvest, but not always. 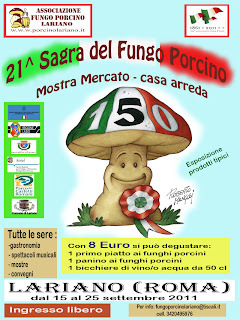 There are now sagre of every kind, celebrating products from funghi porcini and potatoes to pizza and chocolate. If you are a devottee or connoisseur of any particular Italian product, you can likely find a corresponding sagra. 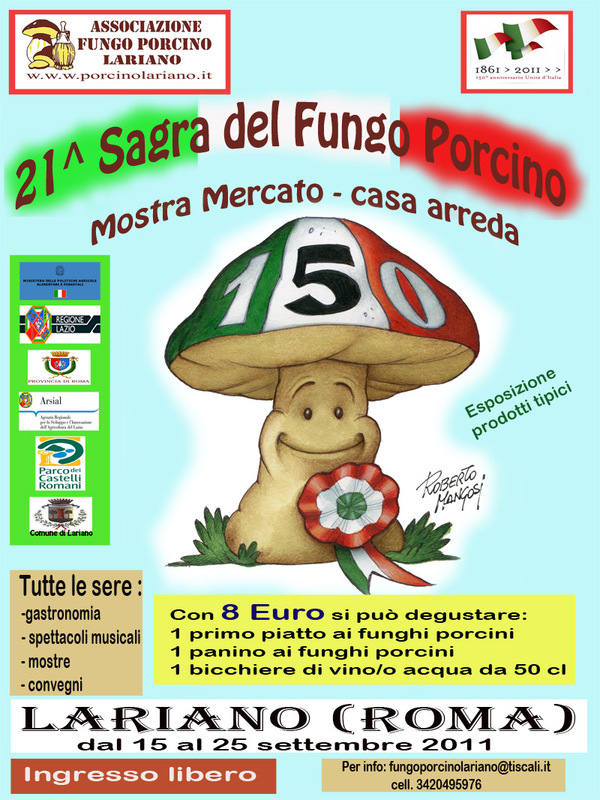 This year I am particularly interested in attending the Sagra al Fungo Porcini in Lariano, Lazio (September 15- 25) because, well, they are amazing! I am also entertained by the fact that every year they give out a prize called the Golden Mushroom (Fungo d'oro) for the person that has most distinguished him or herself throughout the year in the area of culture, performance or sport. I don't know the connection between mushrooms and proud performances, but I would love to see the medal! I am also intrigued by the Sagra delle Castagne, festival of the chestnuts in Soriano, Viterbo (September 28- October 16) because I have immensely fond and vivid memories of getting warm chestnuts off of stands on cool fall days in New York City. Seeing the intensity of the website, in particular the promotional video, I am even more convinced to attend. These people take chestnuts seriously! (Ok, ok, their fervor might also have something to do with the medieval games tournament that they put on... or the chestnuts, you decide). Really the sagre are just another opportunity to celebrate food, and that's good enough reason to attend. Let's face it: most of us don't need to excuse to do that!